Why does such positivity persist around Ipswich Town - a club that has endured one of the worst seasons in its history and been destined for the drop for so long? The inevitable was confirmed on Saturday, ending a sequence of 17 consecutive seasons in the Championship and putting them in England's third tier for the first time since 1957. However, rather than dread, the reaction of those connected to the club is one of optimism. "We really didn't want this to happen," former club captain and record appearance holder Mick Mills told BBC Sport. "Slowly but surely, we've known it's been coming. It's been a gradual process, maybe a three-year thing. "But you have to focus on next season and start to look at the players who can start that campaign and hopefully be the club's future." When Mick McCarthy left Ipswich in April 2018 after five and a half years in charge, former Norwich striker and BBC Radio 5 Live pundit Chris Sutton warned supporters to "be careful what you wish for". Since Sutton used that phrase, it has been regurgitated by other correspondents and employed to goad Ipswich fans now planning away trips to Fleetwood rather than Fulham next season. There was mid-table stability under McCarthy, but a large section of fans had been disillusioned with his style of play for some time, with the Yorkshireman not afraid to give as good as he got. He called out fans who he claimed "ruined" home games last season, calling them "numbskulls", while attendances fell. Even in hindsight, few Ipswich fans regret seeing him go. "It's been a difficult season, nobody can deny that," said supporters' club chairman Mark Ramsay. "But the fans are optimistic. We're looking to the future and moving forward, not backwards. "The football's been far better this season, far more attractive to watch. "We like Paul Lambert, he likes us and we want him to become the modern-day Bobby Robson and move forward with a young squad coming out of the academy." Ex-England captain Mills and Benjamin Bloom, host of The Blue Monday ITFC podcast, echo those sentiments, arguing "change had to come" when owner Marcus Evans decided not to extend McCarthy's contract last year. "The lack of succession planning and where McCarthy left the club made it very, very hard for an inexperienced manager in Paul Hurst not to fall completely flat on his face," said Bloom. "Sometimes it's better the devil you know, but sometimes a change can do you good. "This is, of course, the worst-case scenario. But other clubs have gone down, organised themselves, come back up on a more secure financial footing and created a better feeling on their return, so why can't we?" The future, however, may be filled with some hazardous precedents. Plenty of other former Premier League clubs have dropped into League One in the past decade, with several finding the path back treacherous and long. "What everyone's hanging on to now is a chance to get the club properly organised," Bloom added. "There's almost been an extended pre-season for Paul Lambert for the past five months. "You see clubs like Sheffield United and Norwich City, who dropped down before Ipswich - they already had plans set up in terms of contracts and personnel. "It strikes me in football these days you only really need to have a two-year plan and you're miles ahead of everyone else because of the scale of managerial sackings." Four key components of McCarthy's squad left before the season started. Adam Webster, Martyn Waghorn, Joe Garner and David McGoldrick left for fellow Championship clubs and in their places came a raft of players from League One and League Two. "The four best attacking players left in the summer," Mills said. "The replacements were made, but the fifth-best attacking player from last season in Freddie Sears emerged as the best this season and that tells its own story. "That's where it went wrong and we just couldn't score goals." Lambert, perhaps by default rather than design, has put his faith in the club's academy graduates while implementing his own playing style. Players such as Flynn Downes, Teddy Bishop and Andre Dozzell have emerged from the same production line as former England internationals Kieron Dyer and Richard Wright of previous eras. "The club has to have a structure in order to build," Lambert added. "The great thing about it is it also has a great support and they deserve to see this club do well." Evans pays price for prudence? While other clubs have pushed hard financially to chase the dream of promotion to the Premier League, Ipswich owner Evans has been more frugal. McCarthy's era was characterised by having a watertight transfer budget, bringing in players on frees or using his powers of negotiation to pull off a bargain. But has that financial caution been Evans' and Ipswich's ultimate downfall? "It's a long story with Evans as he was the only person available to buy the club when he did and take on the level of debt," said Mills. "I think he didn't really know the game too well then and trusted managers too much. Amazingly, when he did get one who knew the game well, he slashed the budget. "All the time, it's just been slightly wrong and maybe if he'd surrounded himself with football people rather than business or financial people, it may have been different." Ramsay added: "We'd all like to see the owner put more money in, but I think we're realistic and know we need to stay on an even keel and the club needs to keep moving forward. "We don't want to end up in the sort of situation Bolton find themselves." Even for a club that has had more bad times than good over the past two decades, this is a massive blow. The huge drop-off in television revenue, and potentially gate receipts, will mean that cutbacks on and off the pitch are inevitable. Players who have relevant clauses in their contracts will be forced into taking pay cuts, while the threat of redundancy looms large over the club's non-playing staff. 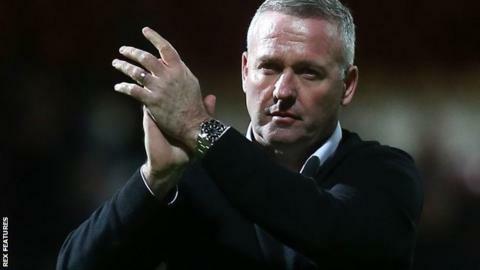 While owner Evans will continue to bankroll the club's day-to-day running, he is unlikely to give Lambert a sizeable war chest for recruitment. For the most part, the Scotsman will spend the summer trying to lure free agents to Portman Road, while if he does wish to invest significantly, there is every chance he will have to sell before he can buy. Bizarrely, given their side's dreadful position, there is a real spring in the step of Ipswich fans - many of whom believe Town's stay in the third tier will only last one season. Their positivity is largely based on Lambert's previous success with Norwich, the signing of experienced midfielder Alan Judge and the hope that a crop of talented youngsters can all step up. The more pragmatic believe a good start to 2019-20 is imperative. Otherwise, more choppy waters could lie ahead.